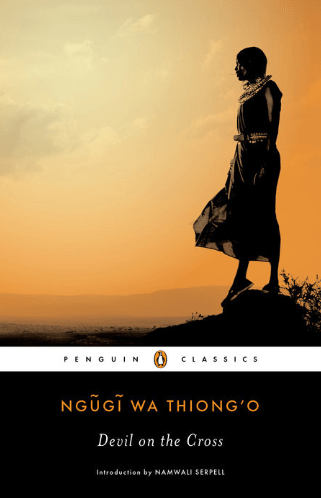 The New York Review of Books has published a piece adapted from Namwali Serpell’s introduction to Ngũgĩ wa Thiong’o’s Devil on the Cross, just published in a new edition by Penguin Classics. An important change in Ngũgĩ’s thinking when he was writing Devil on the Cross was a new focus on his audience: “I knew whom I was writing about, but whom was I writing for?” He chose the material most relevant to the Kenyan public he wished to reach—“the historical reality of a neocolony.” He thought this “new kind of reader”—the kind who would go on to read Devil on the Cross out loud in bars and on matatũs, on factory lunch breaks or after family suppers, the kind who would force the book into a second and third printing—these members of the urban and rural underclass would be familiar with an oral tradition. This tradition encompasses the digressions, proverbs, riddles, and outlandish fables that make the novel such a wild—and hybrid—ride. To read the piece in full, click on the link above.